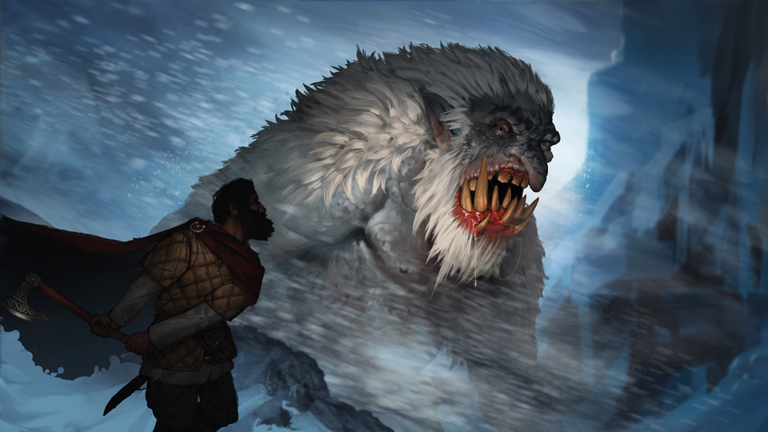 You may be wondering by now why you’d even want to take on some of the dangerous new beasts coming to Battle Brothers. Why risk your favorite guy getting charmed by a Hexe and hacking your other men to pieces? Well, firstly, because people will pay you to. And secondly, because the slain beasts will provide you with trophies from which to craft unique items. Let’s delve into the details! 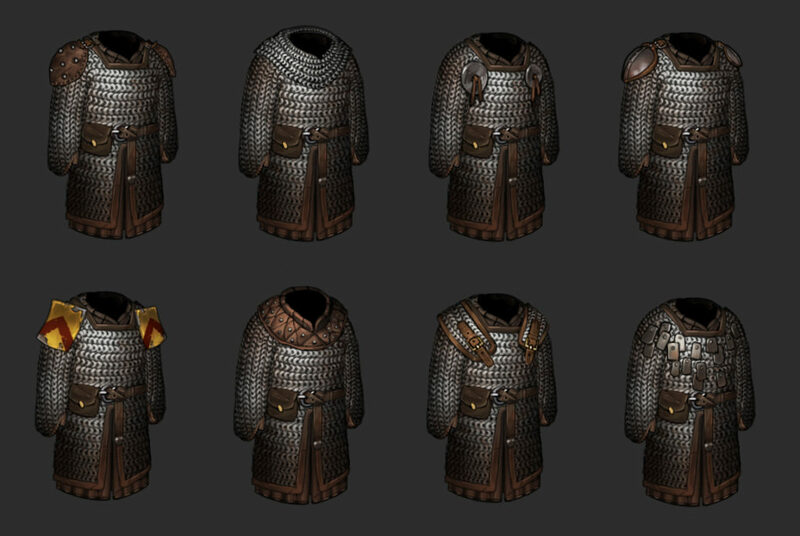 Battle Brothers had crafting events for a long time – things like a tailor being able to craft unique armor from the pelts dropped by Direwolves. This was fine before, because those events were primarily supposed to just add flavor to particular backgrounds. However, if we’re going to have crafting as a full gameplay mechanic, the game needs to have a more reliable way for you to craft what you want to and when. We’re keeping some of the crafting events for flavor, but for most things we’re introducing an entirely new crafting system. The way it works is this: Every beastly opponent comes with a couple of new trophy items, and which one you can proudly claim upon slaying them is randomized. Existing beasts like the Direwolf, Nachzehrer and Lindwurm also receive a loot overhaul if you have the ‘Beasts & Exploration’ DLC installed. These trophies can then be taken to a new building found in settlements across the world: The taxidermist. No worries, you’ll have a bit more room in your inventory so that things don’t get too crowded with all the new loot while you’re on your way there. 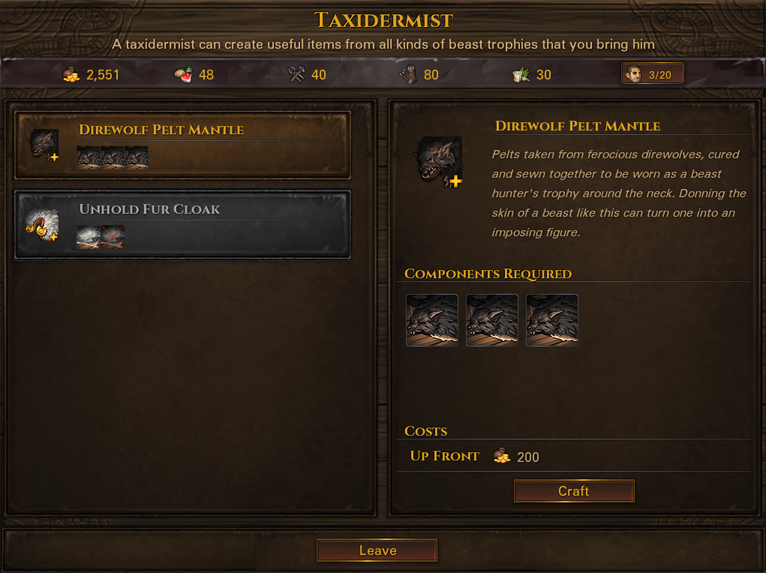 For a price, the taxidermist is able to create all kinds of new items that suitably reflect your achievements in big game hunting from the trophies that you bring him – charms, cloaks, armor plating, armor for your wardogs, shields, antidotes, drugs, and more. At first, you’ll only see a list of things for which you have all the necessary components to craft in your inventory, so you should drop by every now and then with your new trophies to see what can be done with them. Once you’ve crafted an item, however, you’ll always see its ‘recipe’ and all the necessary components, missing or not, so you’ll know exactly what you need to get in order to craft another one. Fighting beasts is about to become much more rewarding, which in turn means more variety in the battles that you should pick, even in the early game. Of course, the more powerful the item to craft, the more and the more rare trophies you’ll need to provide. And here we first touch upon the exploration aspect of the ‘Beasts & Exploration’ DLC; even though some of the new beasts will be quite common, the most valuable trophies will be found only by defeating the strongest of beasts, lurking in the wilderness far away from civilization. If you want to get the ultimate hunting trophies, you’ll have to venture out and explore the unknown corners of the world! So what’s so great about these items that you can craft? Well, one of the major new things that the taxidermist can create for you are attachments with which to customize your armor. What says ‘I myself bested a giant beast of the frozen wastes’ better than donning its fur as a cloak for everyone to see? You’ve seen the Unhold with its white fur. Go and collect that fur as a trophy, bring it to the taxidermist and have him craft you a cloak out of it. This cloak can then be permanently attached to any armor of your choosing. 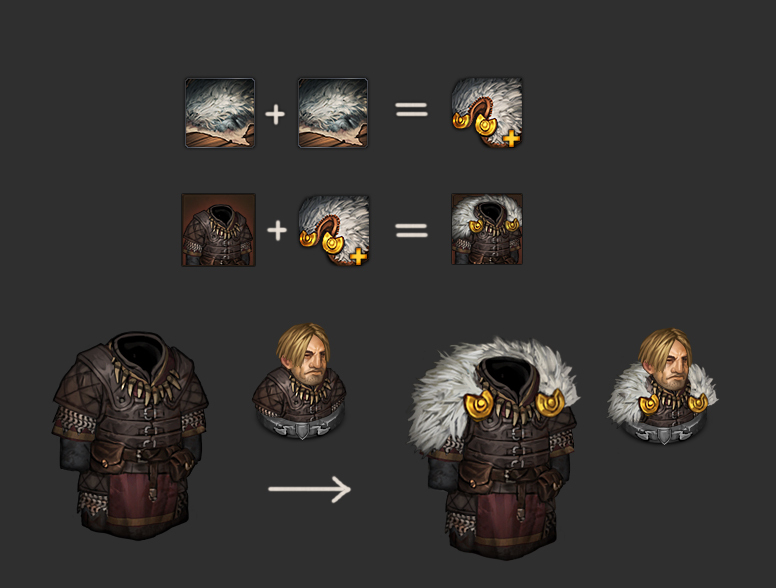 Not only will it make you look like a veteran mercenary badass, each armor attachment also gives a particular benefit – for example, a fur cloak may make the wearer more impervious to ranged attacks, while replacement padding spun out of a certain creature’s silk may make an armor lighter. It means new choices for a mercenary commander, because a single armor can only be adorned with a single attachment. Not all armor attachments need to be crafted. We’re also adding a couple of more common ones made out of metal and leather which you’ll be able to buy in shops and loot from places across the world. Those add additional protection and weight to any armor they’re attached to, but generally at a better ratio than using straight-up heavier armor. Also, they allow for more visual customization of your men, which is always nice. 1) There needs to be a way to see what exactly the thing does, flavour text is great, but, please, don’t hide the gameplay effect info. 2) Are these attachments detachable? Is there a way to remove an attachment to use it in other item? It will be a shame, if stuff will be restricted to famed bases and basic plate will be adorned with basic attachments. I’m not a fan of crafting in games but I must recognize that this is a great improvement for BB. Now we can take profit f Nach teeths and Wolves pelts. I love it !!! i can wait ! Please, add a direwolf head to a helmet. this would be so awesome. That looks just great. really looking forward to this. But i hope you consider both of kems points. Would make it even better. If there exist option to pre order this DLC? Buy the way, I’m ready to pay just for fact that you have returned to development. Keep it up guys ! Armor variety is welcome, especially in the 200 range: I alway buy the mail hauberk and reinforced hauberks mid game, they look nice but could use this added variety! Finally!!! Direwolf attachable pelt! Now i can die in peace. I try to start game with new DLC more then 10 time and no Taxidermist buiding on the map. Is this Bug or Taxidermist is not on all card? There is always at least 1 taxidermist on every map. Did you double check that you have the DLC installed and acitve? It should show in the lower left corner of the main menu. If the DLC is installed and you still have the same problem please send us a savegame to “contact@overhypestudios.com”. Thanks!